The " app wont open from a private developer".. I go to system prefs, security and click the open anyway button, never works. Am I doing something wrong? That pref pane is locked, so you've got to click on the padlock (in the lower left corner) and enter your password first. Still did not work even with unlocked, but the control key seemed to work... still, why not work? Open anyway. I use the "Anywhere" option, so I've never had to address your problem; I can't begin to guess. That link when extracted and entered into the browser comes up with the TinyPic page showing the various URLs to be used in different situations or to the TinyPic page for uploading an image??? Respond in the affirmative and the installer reopens and the installation proceeds normally. If you are doing something different or one of those steps fails — specifically what response do you get? 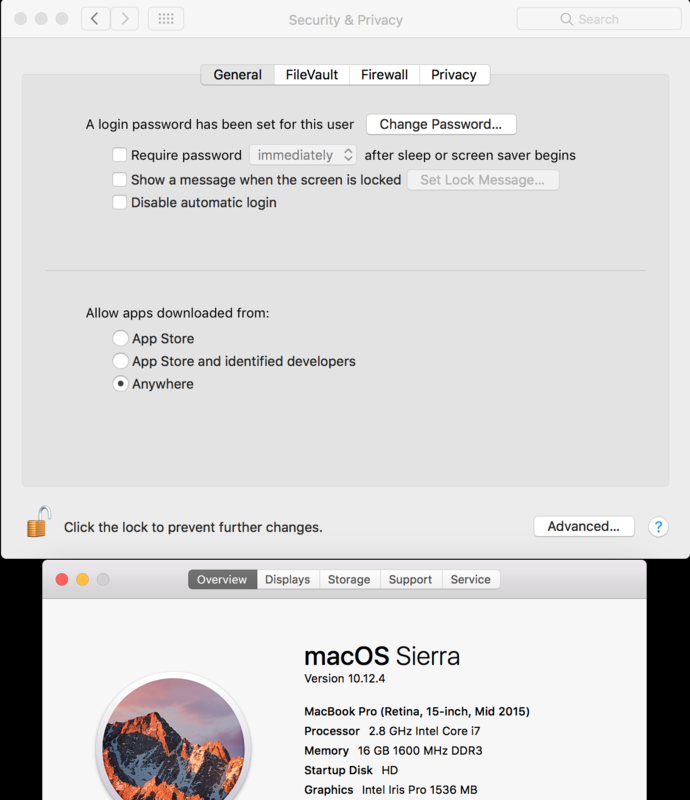 NOTE: the anywhere option no longer exists in MacOS 10.12 (Sierra). Perhaps what I've got is a holdover pref from an earlier OS that doesn't appear in a clean install? I don't have the anywhere option either. I upgraded from El Capitan and it disappeared. I use another trick, namely Control-click the app, select Open from the contextual menu and then follow the prompts. I don't know what to tell you. It doesn't appear on my wife's computer running release versions of 10.12.4 or my computer running 10.12.5 beta and neither has had a clean install or even a combo install in years. MORE INFO: Artie, there is no version number on the prefPanes but Security.prefPane on MacOS 10.12.4 and 10.12.5 are both dated 8/17/16 about a month prior to the initial release of Sierra. You check the date on your Security.prefPane, if yours has a date earlier than that you might consider running a combo update or a re-install from the Recovery Drive to be sure your installation is clean. Security.prefPane is found in /System/Library/PreferencePanes. I assume that's the answer. Thanks Joe, what is best way to post screenshots? I'm on El Capitan still. Thanks Jon, yes the control click seems to be the only way for approval. But that button is so nice, (install anyway), but does not work, even with padlock unlocked. There's no way to post screenshots; the best you can do is post a link, as you did. You can go it one better, however, and use the "Create a link to a webpage" feature...2nd icon from the left, which enables you to give your link a title and makes it prettier. My screenshot (or whatever else you choose to call it). Generated in 1.575 seconds in which 1.164 seconds were spent on a total of 14 queries. Zlib compression enabled.